marital bless: So here it is. The grand old MN State Fair! Tony's foot was okay meaning he was in pain, but it wasn't going to stop him from attending the fair! It was such a delicious day! Here are some pictures . . . 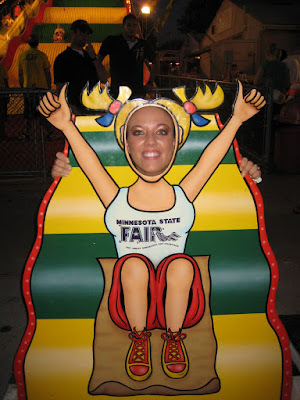 Attending the fair is almost a state holiday in observance of the end of summer. And so fitting, when we returned home Friday night, after a game of Cranium at Beth and Randy's, the air was crisp and just perfect for sleeping! MN Fall we're ready for you! Looks like you had fun. Fried pickles and corn on the cob...yum! 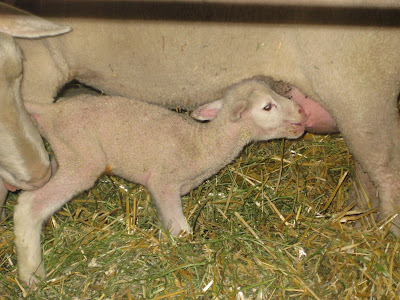 And you saw a baby lamb. Cute! giant slides must be standard at state fairs because we have one in WI too. I am so bummed we won't get to go this year! The babies are not cooperating lately and the heat + walking isn't going to happen right now. I was craving Bull Bites too! There is always next year I guess. Aw, those little critters are adorable. Little missy...you must explain to me how you can eat all that food and still remain teeny weeny! Umm...that dole pineapple-raspberry concoction sounds delish! I'll be there on Tuesday! I can't wait! The food sounds fabulous!! I love fair food. And in that first picture, your friend on the far right looks like Hilary Duff! Oh My Gaw! It looks like so much fun! Invite me next year, will ya?